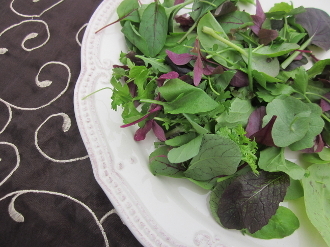 Flavorful blend of fresh greens (no herbs), very versatile. This exceptional mix includes mache, tender lettuces, sweet pea greens, spicy nasturtium leaves, and many more varieties of fresh young greens. Able to stand on its own as a side salad, blended with spring mix, or as a fantastic addition to seafood and meat entrees.